This is a text-hiding tool. It allows to hide (and get back) text within a image. The output PNG can be normal used. The text is encrypted with an password. This Script is totaly new build up from scratch! Hide your personal data from those prying eyes. Hide and retrieve files within a PNG, JPG or GIF Image! Does it work in my Browser? - Yes, it does. You only need a local Webserver or simply install it on your Hosting space. 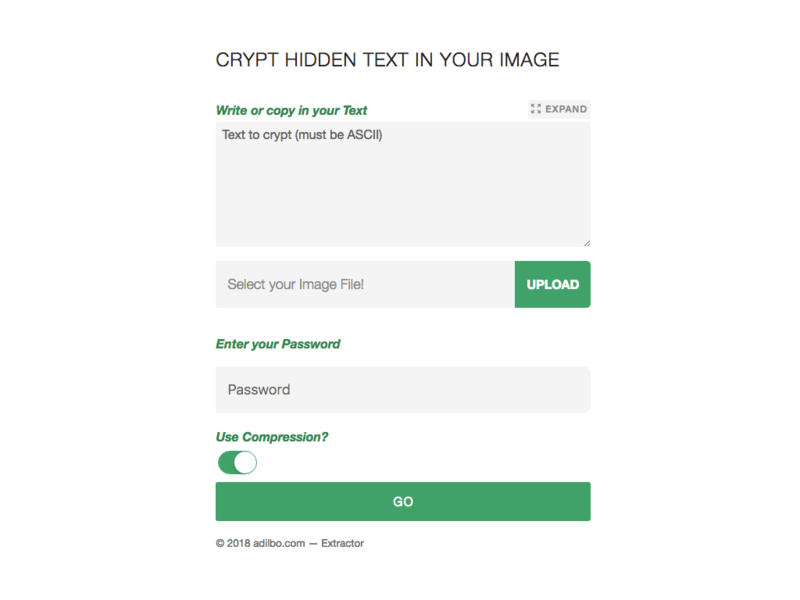 - You can store a text file to be hidden within a normal PNG, JPG or GIF image file. The output image (always PNG) created would work just as normal, but you’d have the secret text within it. How do I retrieve the hidden data from within the output file? - The Script can be used for hiding and retrieving data. However, if you are sending your file to a friend who doesn’t have the script, just send him/her the standalone extractor script (or a Link to your installed extractor script) that is included. How secure is the hidden file? - The Script uses a simple algorithm for encoding your hidden data (using your password, if a password is provided) and so, the hidden file cannot be retrieved easily without decoding it first. So, it becomes much more secure than just joining two files using native copy commands. Especially since no one knows that the picture contains hidden text. I want to check out how this software works before buying it. - Sure. Take a look at the Demo. I want to check out how the output files work before I buy. - Download the Sample File on the Demo Page. That’s it… You are ready to start!! PHP 4.3 or > and GD Lib is all you need! This script does not make any use of special functions, so it will work in nearly every server environment. In case of any problems with specific hostings let me know immediately! If you run into problems please give me not a bad rate, please take a look at the documentation of the script. If you need more help, be free to contact me via the support tab. I will do everything so that my product deserves a 5 star rating! All updates are included. Remember that the script will be updated regularly. Do you want to customize my script as you want? Just purchase the Extended License and shoot me a message from my profile page to let me know how you’re using it. Thanks!